The zeal to defend the country in young hearts and minds is quite heartening. Many of our beneficiaries are passionate about wanting to join the armed forces. One such beneficiary, who wants to stand tall in the defence of the nation, is Aditya Vaghela, from Maa Gayatri Primary School in Maneja, Vadodara. 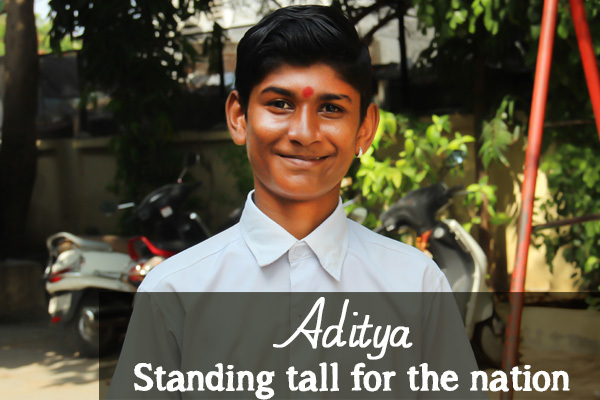 A student of Std VIII, Aditya, one of the tallest boys in his class, has a serious disposition and is quite polite. However, he speaks quite passionately about his plans to pursue a career in the army – “Soldiers keep sacrificing their lives for our nation every day. We need to ensure that there is always someone to defend the nation, so more and more people should join the army,” he states. Sports and academics are the biggest draws for Aditya, who says, “In school, we get the opportunity to study, learn new things and play several sports – athletics, cricket and football. This is why I like coming to school.” The young boy, whose father is an employee of the Gujarat Industrial Development Corporation (GIDC) and mother a housewife, also has a younger brother, Bhavin, studying in the same school in Std V. The young boy’s competitive spirit spills over into various interests besides sports. He recently participated in an elocution competition, where he spoke about cleanliness.